The specter of 2001 A Space Odyssey looms over Christopher Nolan's Interstellar. This film wants to be 2001 for the new generation. The problem is, Christopher Nolan isn't Stanley Kubrick (for better and worse), and the film audience of 2014 isn't that of 1968 (for better and worse). Unlike that iconic space film from one of cinema's mad geniuses, Interstellar is beholden to test audiences and box office success. Unlike 1968, film studios now measure success in Billions with B. To some extent, the tension between art and commerce that exists in Interstellar is as engaging as anything on screen. That is to say, the drama of the film falls flat despite literally reaching for the starts. Sometime in the near future, crops have ceased to grow on earth. Former test pilot and engineer Joe Cooper (Matthew McConaughey) has taken up farming but still yearns to head to the stars. Upon discovering a secret space program due to the diligence of his daughter Murphy, Cooper is quickly drafted to fly a spacecraft to discover a new homeworld. Earth is dying and humanity needs a new place to hang it's hats. The future society on Earth is underdeveloped, and if the films goal was to inspire awe about the universe, the less time spent at parent-teacher conferences, the better. Cross-cutting crop fires and a black hole, for example, was a poor choice visually. Fire can inspire awe and fear... but not as much as a black hole, and especially not when the focus diverts from the power of nature itself, but a tricky plot twist. The film can't decide it wants to seriously engage about the realities of space exploration (ie people sign up for a one way trips) or the realities hit driven filmmaking (ie The Hero Saves The Day). It tries to have it both ways. Characters continually jeopardize their mission and the future survival of the human race in order to return to loved ones. The personal and the epic do not blend well here, thematically or visually. It's hard to fault this film or its creators for their ambition. It has some pretty interesting tricks involving space-time, including "time" moving faster on some planets. That said, Interstellar boasts some of the clunkiest dialogue ever uttered in such an obviously intelligent film. Expositionary dialog has never been a strong suit in Nolan's films, somewhat surprisingly. How does such an acclaimed visual, filmmaker not find a way to show the rules of his universe in a cinematic way? The film explains wormholes in the exact same way as Paul WS Anderson's Event Horizon did back in 1998, with a piece of paper and a pen. Despite his resurgence as an acclaimed actor, Matthew McConaughey is miscast as Cooper. In his defense, it would be difficult for anyone to play a mismash of Tom Joad, Heywood Floyd and Top Gun's Maverick. McConaughey could have pulled off either Joad or Maverick, very few actors could do all three at the same time. 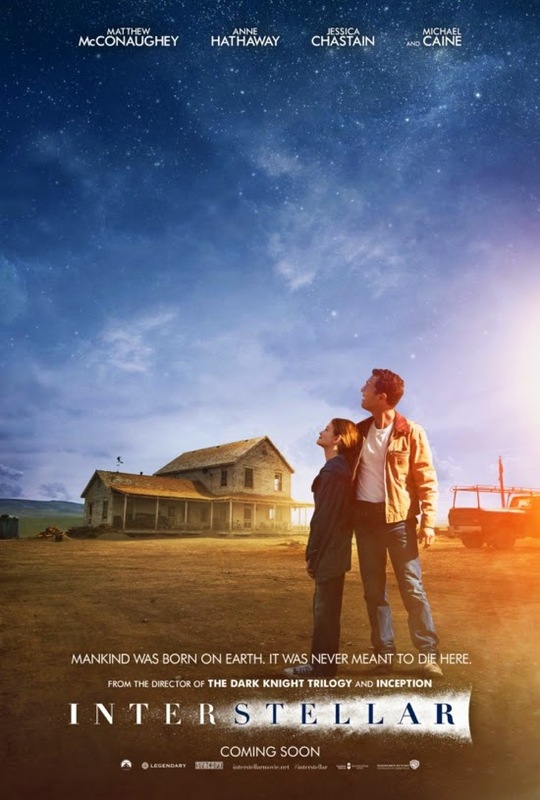 Interstellar is a beautiful, ambitious film but, yikes, is it ever a mess both thematically and visually. I was entertained and will likely see it again... but it is as far from a masterpiece as the next solar system is to Earth.